Tim qualified at Bristol University in June 1996 and joined Barker Dental Care in 1998, becoming practice owner in March 2007. Tim has attended numerous postgraduate courses on a variety of topics including endodontics, implant restoration, Fastbraces orthodontics, Invisalign orthodontics, Inman Aligner orthodontics, temporomandibular joint disorders (TMD), restorative and cosmetic dentistry. In particular, he has attended the residential courses at the world famous Pankey Institute in Miami and the Las Vegas Institute for Advanced Dental Studies. Tim is also completing a year long course with Dr. Basil Mizrahi who is a specialist in prosthodontics and restorative dentistry in Harley Street, London and who is one of the country's leading experts in his field. Tim continues to build on his knowledge and skill base and strives to advance the practice by investment in new methods, materials and equipment. 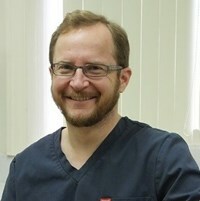 Tim has a wonderfully caring and patient chair-side manner, which combined with his years of experience and knowledge provides his patients with exceptional dental care. When not working, Tim enjoys keeping fit and has played hockey for Fareham hockey club since he was a teenager. He also enjoys traveling as well as walking/hiking particularly in the Lake District. Great emergency cover at Barker Dental Care today. Thank you. Just a quick note to say a heart felt thank you to Tim for turning out Saturday morning to sort my tooth abcess. I so appreciate your constant kindness, thoughtfulness, and professionalism. Can't tell you what a difference you've made! Thank you so, so much. I would just like to offer once again my sincere thanks for your first class service, and most importantly for helping me completely get over my phobia! When I was 13 I slipped on ice and fell causing a considerable amount of damage to my top front teeth. At the time I was due to have braces fitted but because of the accident it wasn't possible to go ahead. For such a long time after I hated my teeth. They weren't straight. One of my front teeth was particularly protruding and they were discoloured and stained. I was very embarrassed and self conscious. I never used to smile in photos. After deciding that I was going to have work done to them, I did my research and went to a considerable amount of dental practices all over the South of England for consultations. A lot of the dentists I went to for consultations only offered what they considered was the best plan. There wasn't a lot of choice in it for me. Tim however listened to me and understood my requirement instantly. Deciding to go to Tim was without a doubt the best decision! he was honest from the start about what he thought he could achieve. He gave me a variety of options that suited different budgets and explained in detail his recommendation. Tim's work speaks for itself. I am so happy and grateful for the work he has done for me and it's been life changing. He is such a lovely person and I truly believe he is adamant that his patients receive the best possible treatment. On top of that the practice and its entire staff are so welcoming. They are consistently professional and more than accommodating and I truly felt like they all had my best interests at heart the whole time. Thank you so much! My note is simply to confirm the excellent fit of the new denture. Compared with the previous (which is now 'the spare') the new denture is a tighter fit, requiring no adhesive. The bite, too, is more effective. All in all, therefore, this has proved a most useful exercise. My repeated thanks for the good work! I was experiencing frequent migraines where my vision would go blurry and I would have a long painful headache and feel sick. I went to the optician and it was reported there was no problem with my eyes. So I went to my doctors surgery where they gave me a strong medication but this did not seem to work. I went to my routine annual dental check up, when Dr. Tim Barker asked if I was suffering with headaches. I was shocked that he asked me this and then he asked if I grind my teeth at night which I do! It had got to the stage where I was grinding my teeth so much that the pressure was causing these horrible headaches. So Tim recommended this small plastic device that I could wear at night to stop me grinding teeth on teeth and he said it would more than likely stop my headaches. At first I did not believe that this small expensive device could stop my headaches. However a year on, my migraines have reduced to near enough none from having them at least twice a week! I am so grateful to Tim for recommending this device,. The damage I was causing my teeth from grinding them together was extremely bad. Therefore, I will use this device forever more to prevent ruining my teeth and to stop my headaches! Completely worth the money! Thank you so much! Prior to my Fastbraces treatment at Barker Dental Care, my mouth was overcrowded with my front right tooth in particular protruding forward and aching slightly. The treatment has worked very well and I am now much more confident smiling. The cost of the Fastbraces treatment was competitive when compared with other quotes I obtained and I would not hesitate to recommend them and Barker Dental Care to anyone. Thank you Tim and Carol. I have just had all my teeth cleaned with a new gadget called air flow. It was brilliant. Normally I have to have injections as my gums and teeth are so sensitive to having them done with ultrasonic. This time I did not feel a thing. It was fantastic.